Water is essential for life and there are many situations where clean water is not available. If you’re lucky, you can last maybe 3 – 5 days without water. If you loose 10% of your bodily fluid you are at risk of death. 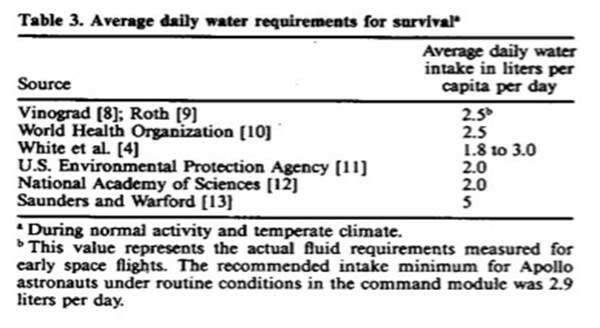 The report carried out by the Pacific Institute of Studies also looked at what the minimum requirements of water needed by an individual were – you can see this in the table below. However, other sources quote amounts around 3.5 pints per day. The table below is in liters, to convert 1 liter is around 1.75 pints. Bear in mind that if certain war events have taken place rain may be contaminated and unsuitable for drinking. This is also true for river and stream water. If you have time to think about it beforehand, you can stock up on bottled water. The Department of Homeland Security recommends that you store at least 1 gallon of water per person, per day, for 3 days. The International Bottled Water Association say about storing bottled water, that it should be stored at room temperature or cooler and away from direct sunlight and chemicals. This is because at warmer temperatures algae can form in the water and that the plastic of a water bottle is permeable and can allow chemicals to seep into the water. The FDA don’t require an expiration date for bottled water, but the state of New Jersey do set a 2 year limit on bottled water. You can store water in rain barrels by filling them from the cold-water tap. You can buy 60 gallon barrels for the purpose and keep these ready to go. The barrels MUST be very clean before you use them. Also you really should use some sort of sterilizing chemical to prevent algae and bacteria from contaminating the stored water. 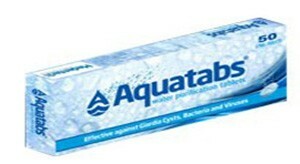 You can buy purification tablets or powder, like Aquatabs online from Amazon. And of course, you can use the barrels to collect and store rainwater too, assuming the rain is not contaminated. You can buy large, up to 15,000 gallon, water tanks to prepare for when the SHTF. As with the smaller rain barrels you will have to use purification chemicals to make sure the water stays clean and drinkable. 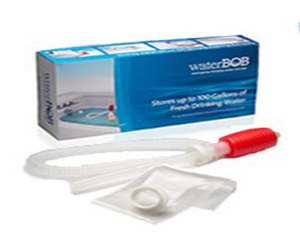 There is a product called the waterBOB, which is an FDA approved plastic balloon, which can be filled direct from your faucet, aka your bathtub, and which keeps water clean for up to 16 weeks. It also can hold up to 100 gallons of water. If you place this in the tub and fill it up, it resolves the issue of keeping the water clean. Of course you might not be able to fill up the waterBOB or have access to bottled water, so you’ll need to collect it. 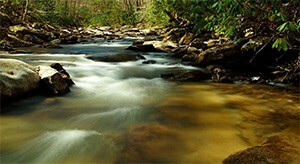 You can drink water from a non-salt source like a fresh water river or a creek. However, you do have to be careful and sensible. I was taught to look up stream and if there was any evidence of a dead animal or any contamination, then don’t drink it. You can of course sterilize the water. You can boil it, which gets rid of bacteria, protozoa (like cryptosporidium) and most viruses. 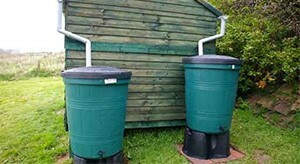 You can collect rainwater using a simple system, like the one in the photo above, where guttering on a small shed or similar is used to pass collected rainwater into a rain barrel. Use some sort of filter at the end of the pipe to stop debris entering the barrel – be sure to clean this out regularly as it gets filled with leaves. There are commercial rainwater collection systems that you can use too. Companies like RainHarvest Systems provide home based collection systems that can harvest up to 15,000 gallons of rainwater. Which ever way you collect the rainwater, you need to be wary of any potential contaminants in the rain, including radioactivity and acidity. Drinking something in is a great way to get toxins into your body. If it’s nuclear don’t drink it, period. If its acidic, you can treat it with an alkaline solution like sodium carbonate, but you need to test the acidity with an indicator of some kind to make sure you get the balance right. 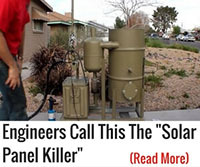 It is also wise to sterilize the rainwater you collect. Save plastic bottles used in commercial bottled water. Refill with fresh water from sources such a clear running stream, rain water or any source without toxic elements. Place filled bottles on a reflected surface in bright sunlight for 10 hours. The Sun’s UV Rays will sterilize the water for drinking. Bottles can be cleaned and reused. This is a great way to store your water. I remove the Labels from my 32 oz. Gatorade bottles, store them in the sun and the results equals in taste to spring water. Wash the bottles, fill with water and put them back out for re-use. For my BOB I use the 20 oz., much easier to carry in the pockets. Live long and plan ahead! The water storage method you mention should work great but with some cautions taken. Choose bottles by the type of plastic used as most leech chemicals into the water stored. Avoid the ones with 3 or 7 in the recycle symbol. Also, while water can be treated to be drinkable in a day’s worth of UV from the sun, storing it that way may promote alae growth in the long term. Don’t forget having on hand the means of filtering, purifying, and/or treating water in addition to keeping a stored supply. For years, my wife and I have been using empty bleach bottles. When the product is gone, I simply fill them without washing them out….reg bleach ONLY! I have drank water that was over 15 years old from these! Little flat, no smell or bad taste, and shaking made the water good! The containers were stored in s dark, cool if not very cold (frequently freezing) shipping container, and the plastic showed no ill effects from the years! Still use this method. I’ve heard that from a friend as well. But, do you still have to use water purifier tabs or no? Is the residual bleach enough to purify? Even after 15 yrs? For sun sterilization of water, use no larger than 2 liter bottles. The water must be clear. Cloudy water requires longer sunlight exposure. The bottles also must be clear without labels or other impediment to sunlight penetrating the bottle. When in doubt, use more sunlight exposure. You could fill the washing machine with water and gain about 40 gallons plus the bathtub water and water heater volumn would give you a quick start. 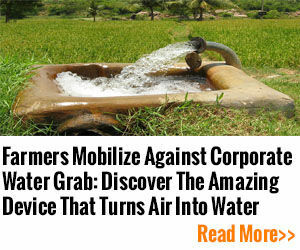 But turn off the water when the water service can’t produce clean water. Great suggestion about the washing machine for water storage. It hadn’t occurred to me. You are absolutely correct. That is a great water storage facility. I would only fill it with the cold water tap turned on. That way if the water supply should die part way through filling, the water heater would still be full. Same thing with the BOB water storage device. Only fill it with the cold water tap to preserve any water that is in your hot water heater.